This was just kind of fun...I received an email from one of our RuffleButt customers. "I have been telling all of my friends with girls about Ruffle Butts! Her outfit is ADORABLE! I definitely plan to order more." 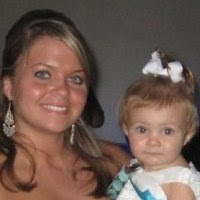 Turns out her name is Amber and her daughter's name is Aubry! So, meet Amber & Aubry (great name choice by the way!!)! I must say that I have learned a lot, A LOT, of lessons since starting this business, but one of those lessons has been that you can not sit back and wait for things to come to you. Those that put themselves out there, work hard and think outside the box, are the ones that stand out from the crowd. So, when I received this email, I knew that this gal has something special. She is willing to go above and beyond, she is not afraid to ask for help. This is truly the 1st step to success. And, not that I am the master at any of this, as I am still learning everyday, and try to remember to do these types of things myself. So, I wanted to share her email and support her in her new endeavor, as we all start somewhere and she is obviously working hard to do it right! "I love your website and how you talk about how great it is for women to start up their own companies, be creative etc. I'm a preschool teacher who has started a baby gift business on the side. I'd love any advice you have, Rufflebutts seems like it is everywhere these days!! My website is www.BlissyByBrittany.com if you want to take a look and let me know if you have any ideas for me as to how I can best get my name out there! Thanks so much, Brittany"
It is so tough, as we are all so busy, and unfortunately, I don't have enough spare time to keep in touch with many of the incredible women that cross my path. But, just know this, if you are on this same journey, at any stage in the game, we are all in the same boat. Some days are good, others just stink. Some people are great, supportive, encouraging, and others want nothing more than to sabotage your efforts. This is just life...in any job. As an entrepreneur, sometimes we feel like the weight of the world is on our shoulders, but if you give it your all, make the best decisions you can with the information at hand, and most importantly, do it all with the integrity you would be proud to show the world, then you are doing well. There are many days when I second guess myself, when I wish I would have done something differently, when I wonder if I am making the right decision. There are days when I wonder if I am good enough to make this work. Then I open my email to find pictures or notes from some of the most encouraging and amazing moms & grandmas out there, and I remember what I am really doing everyday. Obviously, this is a business. I work so hard everyday to build this company and some day create financial stability for my family. But, what really drives me, what truly gives me that incredible fulfillment that I longed for, are those precious little angels grinning from ear to ear in my creations. Watching the moms and grandmoms ooh and coo over their adorable little ruffled princess. Brittany, work hard, don't let anyone discourage you. Keep thinking outside the box, reach out for help, be true to yourself. And, be sure to run your business in a way that will make you proud. We don't do this often, but I had so much fun giving away free t-shirts last month, that I wanted to do something again this month. 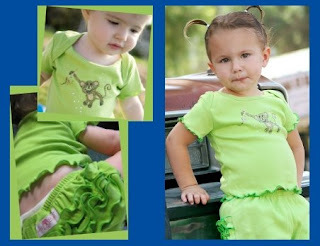 So, for a VERY limited-time, we are offering our Lime Knit RuffleButt Bloomer for only $5 with the purchase of the matching "Monkey Fun" rhinestud tee! !